The Amareshwar Mahadev Temple is a beautiful, grand temple that is mainly dedicated to the Hindu deity Lord Shiva. This temple is a representation of all the 12 Jyotirlings that are spread all over India. 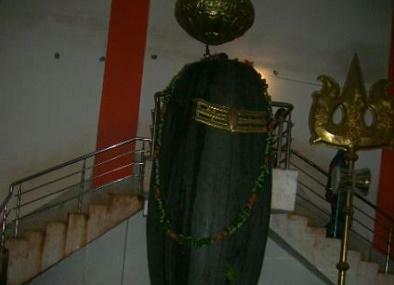 The most astounding attraction of the temple is the spectacular eleven feet tall Shivalingam placed inside the temple building. The whole area around the temple radiates a feeling of peace and serenity that can usually only be felt at very few, select locations. The lush green trees further accentuate the pious atmosphere of the Amareshwar Mahadev Temple. Follow Hindu Temple customs such as removing of footwear outside the temple and wearing modest clothing. Ask locally about accurate Amareshwar Mahadev Temple timings. By renting or hiring a car/taxi. Love this? Explore the entire list of places to visit in Amarkantak before you plan your trip. Fancy a good night's sleep after a tiring day? Check out where to stay in Amarkantak and book an accommodation of your choice. How popular is Amareshwar Mahadev Temple? People normally club together Kapildhara Waterfall and Shri Sarvodaya Digambar Jain Temple while planning their visit to Amareshwar Mahadev Temple.